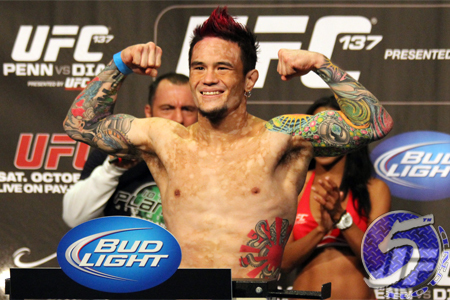 With Ian McCall forced to withdraw from their UFC on FOX 9 scrap with a hand injury, Scott Jorgensen has been issued a new assignment for December 14. Jorgensen now meets former flyweight top contender John Dodson inside Sleep Train Arena in Sacramento, California. UFC officials confirmed the tango Tuesday afternoon. Dodson is just 10 days removed from his KO victory over Darrell Montague at UFC 166. He was petitioning for a quick turnaround after suffering through a 10-month hiatus before the bout, despite being healthy the entire time. Dodson is victorious in six of his past seven outings. Jorgensen, meanwhile, has fought under the Zuffa banner since 2008. He went 7-3 in the WEC before the promotion closed its blue-caged doors. However, “Young Guns” has won just half of his six bouts in the big leagues. The 125-pound affair will likely appear in the night’s prelims.